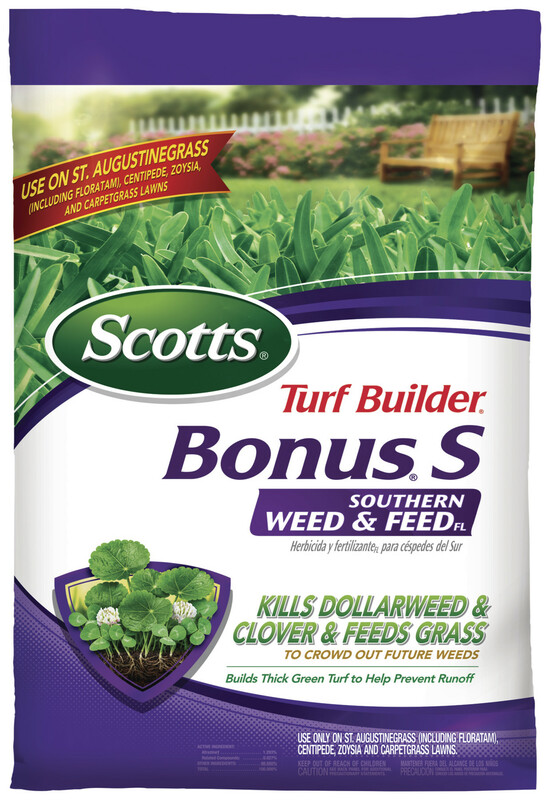 Scotts® Turf Builder® Bonus® S Southern Weed & Feed FL will not only kill weeds, but also thicken your lawn to help crowd out future weeds. Regular feedings provide the nutrients your lawn needs to look its best and withstand the stresses of heat, drought and family activity. Bonus® S may be used on St. Augustinegrass (including Floratam), centipede, zoysia and carpetgrass lawns. Apply when grass and weeds are actively growing. Only available in Florida. Kills weeds including dollarweed, clover, and other listed weeds: Black Medic, Blue Toadflax, Buckhorn, Burclover, Carolina Geranium (Cranesbill), Chickweed, Clover, Clover (Hop), Clover (White), Dandelion, Dichondra, Dollarweed (Pennywort), Evening Primrose, Florida Betony, Florida Pusley, Fragrant Cudweed (Rabbit - Tobacco), Henbit, Lippia (Matchweed), Oxalis (Yellow Woodsorrel), Pepperweed (Peppergrass), Purslane, Red Sorrel (Sheep Sorrel), Rescuegrass, Sephard's-purse, Sowthistle, Stinging Nettle. For severe weed problems, a second treatment may be required 2 months after the first.